Bhangra (ਭੰਗੜਾ) : – Bhangra is a famous dance for Boys. Punjabis performed Bhangra at birthdays, parties, marriage, receptions and other occasions. In bhagra play dance with large drum that called dhols. In Bhangra person sing boliyaan, one person plays drum (Dhol) and other play the other musical instruments. 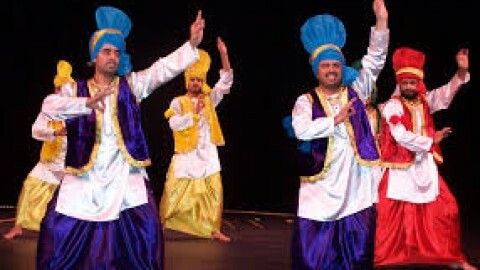 In Bhangra men wear the turban, kurta and lungi. This is the traditional Punjabi bhagra dress. Drum is main instrument for play bhangra and also used other instruments like Tumbi, Chimta etc. Giddha (ਗਿੱਧਾ) : – Giddha is a famous dance for girls. In this Giddha girl enact bolis and dance. 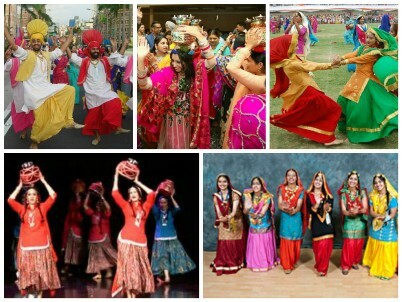 Giddha is a popular dance from the Punjab for girls and women. Gidhha is a colourful and more energetic dance. Giddha is performed with clapping and boliyan. Giddha is performed in the circle. A small drum which plays with hands called Dhol. Dhol is used for rhythm and it is main instrument for performed giddha. And everyone likes this dance. In Giddha wear the traditional dress or ornaments like suggi-phul, haar-hamela, pazaibs, raani-haar and baazu-band. Traditional dress adds charm to grace and it is comfortable and allows women to perform dance with ease. This dress is very simple and attractive. Dupatta is heavily embroidered in the costume. Jhumar (ਝੂੰਮਰ) : – Jhumar word comes from Jhoom. Jhoom means Waving. This is a slower dance and more rhythm. This dance is performed at the marriage ceremonies usually. Jhumar dance performed in circle. This is a part of Punjabi dance. Luddi (ਲੁੱਡੀ) : – Luddi is a special Punjabi folk dance and it performed at the special movements. In this dance person put one hand on their backs and second hand in front of faces. And a drummer is in the centre of dancer. Sammi (ਸੰਮੀ) : – In this dance dress is kurtas and long skirt called lehngas. Sammi is also part of Punjabi dance. Dhamal (ਧੰਮਾਲ) : – This dance is basically for boys. And this Dhamal dance plays in a circle. Jaago (ਜਾਗੋ) : – Jaago world means “jag” wake up. This dance performed in the marriages, women’s dance with candles light and sings songs and play dance. Kikli ( ਕੀਕਲੀ) : – Kikli is the famous Punjabi dance for women. In this dance girls play dance in pairs and cross their arms or hold hands and play in either clockwise or anti clockwise direction. Also perform Kikli dance four girls. This is also a part of the mosaic of Giddha.